Submitted photo State Rep. Robert Sprague (R-Findlay) made a campaign stop in his bid for Treasurer of State July 16 at the Greene County Republican Headquarters. Sprague was the featured speaker at the first lunch with legislators and shared his vision for the treasurer’s office. Sprague outlined his commitment to working with public and private sector leaders to implement a social impact bond program through the Treasurer of State’s Office. 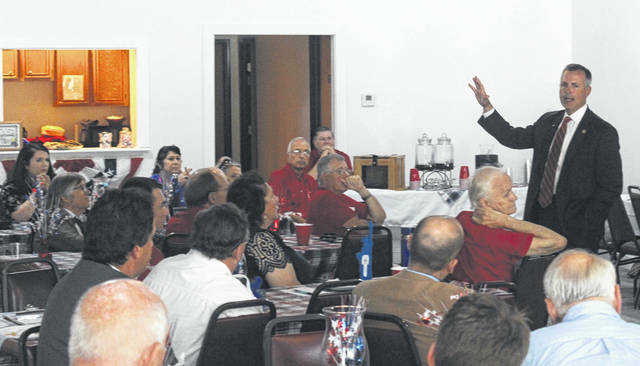 https://www.xeniagazette.com/wp-content/uploads/sites/32/2018/07/web1_GREENE_LUNCH.jpgSubmitted photo State Rep. Robert Sprague (R-Findlay) made a campaign stop in his bid for Treasurer of State July 16 at the Greene County Republican Headquarters. Sprague was the featured speaker at the first lunch with legislators and shared his vision for the treasurer’s office. Sprague outlined his commitment to working with public and private sector leaders to implement a social impact bond program through the Treasurer of State’s Office.